My friend Erick sent me a link to this t-shirt this morning. 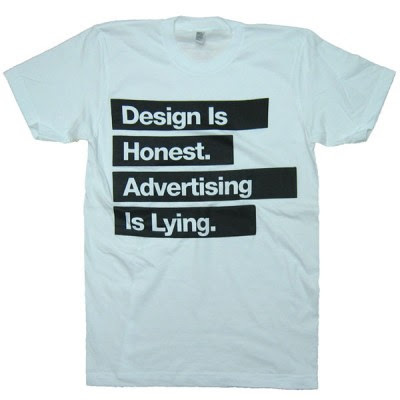 Which was ironic, since just last night, I'd written an email to a friend who's working on a book about design which included the line "Good design is increasingly seen as tangible proof that Company X cares about me, while advertising is increasingly seen as tangible proof that Company X is lying to me." It's something I've written about before, but bears repeating every now and then. At a time when media fragmentation means you can't be sure how exactly someone found you (Search Engine? TV commercial? Blog post? Word-of-Mouth?) good, consistent design is your strongest asset. That means everything from the product itself to the store to the website. Good design very clearly says "these people care about their customers enough to make sure that the store/website/product is well-designed and pleasant to interact with. That makes me feel wanted and valued." And it says it far more effectively than $75 million worth of advertising.